A friend of mine in Sydney recently realized his Irish passport is about to expire. He's planning a trip home in the summer so it's a good thing he noticed now, and not in a few months time. Chatting with him via Skype the other day got me thinking about the passport renewal process while living overseas. I did it myself about 5 years ago via the Irish embassy in San Francisco. It's a pretty simple process, but I figured it'd be a good idea to tell you what to expect. The one strong piece of advice that I would give you is to be sure to give yourself plenty of time when renewing. You don't want any upcoming travel plans to be ruined. I don't want to recommend any amount of time as it changes depending on demand, but your local Irish embassy should be able to give you a good idea of how long the renewal process should take. 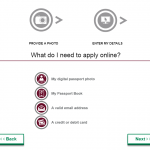 Part of the reason for allowing extra time is due to the fact that you can't just download the passport application form online and fill in it. I'm not too sure as to the reason why, but the embassy insists on mailing out a copy of the application form to you. The only minor difficulty I had during the application process, that I can remember anyway, was finding a place that took passport photos that met the Irish criteria. At the time, and I believe it may still be the case, the requirements (size, pose, etc), were a little different to the US requirements. I couldn't just use the passport photo booth at the local drugstore, as they are set up to take US style photos only. However, it took just a few phone calls to find a place, albeit a 25 mile drive away, that could take the photos that I needed. As you can imagine the price was a bit inflated as a result. Wherever you live in the world, contact your local Irish embassy to get the relevant form. In my case, it was the San Francisco Embassy. You can find the embassy closest to you at this DFA.ie link. You will also find the latest fee information there. In addition to the time it takes to receive your application by mail, you will also need extra processing time due to the fact that the application process is heavily reliant on the middleman - i.e. the embassy. When you complete the application, you will send it, along with your photos and expiring passport, back to your local embassy (be sure to register/track the package). Then they will send it to Dublin. From there, the new passport will be sent to your local embassy, and finally forwarded onto you. Unfortunately, in today's ever changing technological landscape, passport identity theft is a concern of mine while travelling. Sadly, people have developed 'skimmers', that allow them to electronically grab your personal information from many sensitive items including passports, credit cards, licenses and more. You can protect yourself against this kind of theft, by carrying such items in an RFID blocking passport holder. The one I used on a recent trip was the Zoppen RFID blocking travel holder (like the one in the picture). It comfortably and securely holds your passport and has plenty of space for ID and credit cards. If you need a little bit more room for other items, there are other options such as their multi-purpose RFID blocking holder/wallet. The new Irish passport card is valid for travel within the EEA only. I am currently in the process of applying for one, and will let you know how that goes when I receive it. In the meantime, you can find details about it here. I finally applied for the passport card. Check out the details here. Have you applied for your Irish Passport card? I have.